The City of Albany began implementing its Bicycle Master Plan in 2009. Albany's Bicycle Master Plan is a comprehensive study identifying a network of bicycle route classifications and street treatments for improved cycling within the City. These route classifications cater to the different types of cyclists found on urban streets--supporting a safe and healthy transportation alternative for those cyclists that are "timid riders," "confident riders," or somewhere in between. Street treatments and intersection upgrades also make it safer and easier for pedestrians, which is paramount to enhancing quality of life and mobility in and around the City. 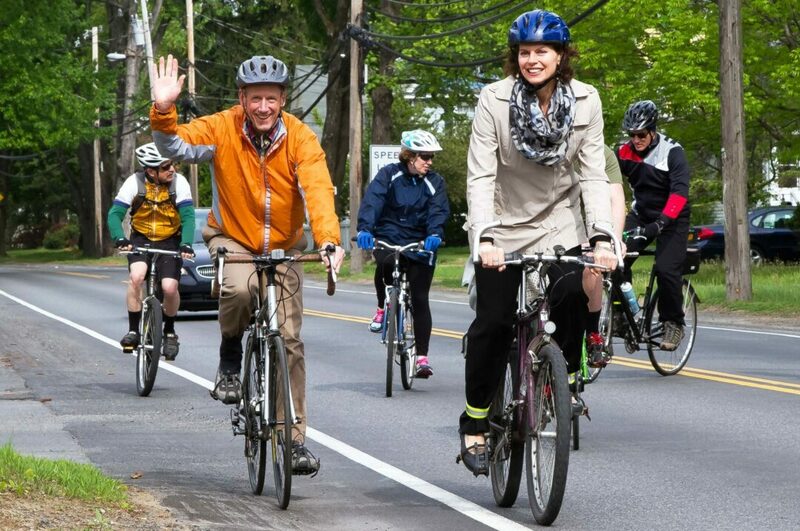 The Bicycle Master Plan fits with Albany 2030 and the Climate Action Plan, setting sustainable goals to create a healthy transportation alternative that connects neighborhoods and destinations. Identify pilot projects for short-term implementation. Since the completion of the Bicycle Master Plan, Albany has made a number of improvements for cyclists and pedestrians. To date, over 26-miles of bicycle infrastructure has been added throughout the City, including shared-use markings (sharrows), signage, bike lanes (see Madison Avenue Road Diet Phase II) and multi-use path improvements. Bike parking is on the rise, with an estimated increase of 1,500 parking spaces, and a popular Citywide bike share program--CDPHP CYCLE!--is now available throughout the Capital Region. Other exciting bike-ped projects to follow include: the upcoming Albany Waterfront Connector (South End Connector) and Albany Skway. Visit Albany's Bicycle Infrastructure Online Map. Find Bike Parking in Albany. Try Albany Bicycle Coalition's Route Finder to get around the City. Know the laws of the road. Ride safe, and have a clear understanding of the laws that pertain to cyclists. A new public service video, produced by the New York State Bicycle Coalition provides safety instructions for everyone.